Plans call for demolishing the bridge and building a new one in its footprint while maintaining traffic both ways. Built more than a century ago, the North Washington Street bridge between Charlestown and the North End is not the most pedestrian-friendly stretch of the Freedom Trail. Actually, it might be the least. But the old bridge may not have to carry the load much longer: A proposal for a new $90 million expanse is nearing completion, and Jayasinghe said he expects to unveil plans and pictures to the public in September. It will be years before a new bridge is completed. Even after the project is approved, the state money needed to start construction will probably not be available until 2017. But the bridge he envisions will be a much better experience for those who use it to cross the Charles River. “A bridge today, first and foremost, must be multimodal,” said Jayasinghe, referring to the various ways people might cross it. Wider sidewalks and seating areas will encourage walkers to stop and savor the view. Dedicated bicycle lanes will make crossing safer. And a fully paved roadway could make crossing the river a less scary affair, for humans and equines alike; the Boston Redevelopment Authority in June scuttled a plan to move a staging area for horse-drawn carriage operators to Charlestown because the bridge’s metal grate spooked the horses. The new bridge will also come with a new name. The plan Jayasinghe will pitch to neighborhood groups, the public, and businesses will call for demolishing the existing bridge and building the new span in its footprint while maintaining traffic in both directions throughout construction. That is critical, Jayasinghe said, because hazardous materials cannot be trucked through the Interstate 93 tunnel downtown. 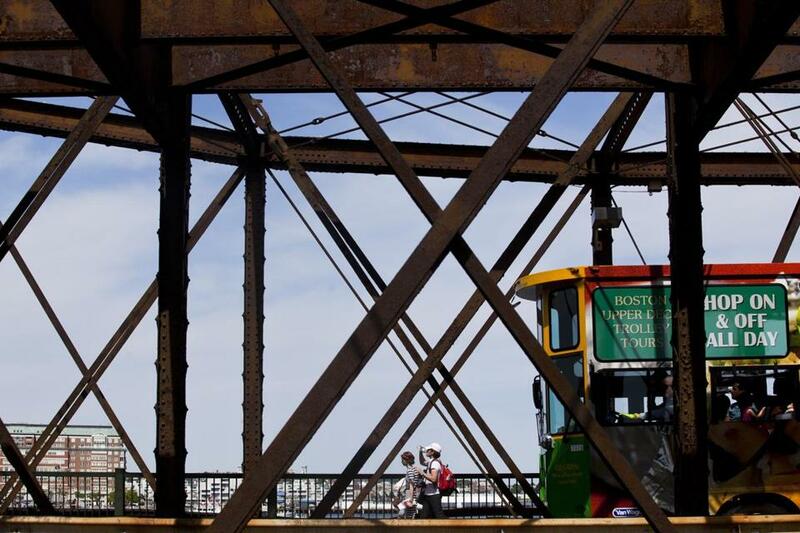 Keeping the bridge open — moving traffic to half of the old bridge, then half of the new bridge, utilizing the old bridge’s currently shuttered middle passage — will also keep the Freedom Trail whole. “With over 4 million people visiting Boston’s historic sites on the Freedom Trail each year, the bridge is their connection between the sites in downtown Boston and the North End to those in Charlestown,” said Suzanne Taylor, executive director of the Freedom Trail Foundation. She said the new bridge would be a “spectacular addition” to the trail, citing wider sidewalks and a seating area overlooking the harbor. Architect Miguel Rosales of Rosales + Partners said his aim in designing a new bridge for the city was to “complement the Zakim Bridge” — not detract from it. He said he has been working on the plans for about a year, and expects the public to get a peek in the fall. “It’ll be interesting to see what the city is proposing,” said Evelyn Addante, a Charlestown resident who serves on the neighborhood council. She said she would be interested in preserving or restoring the existing bridge, but only if the costs are reasonable. Jayasinghe said those two factors — personality and price tag — are among those the city is seeking to balance. Some of the old bridge’s personality came free of charge. Fortunately, few acrophobics — people with an irrational fear of heights — are likely to see the bogus reassurance: The last place they will be looking is down.